I must be doing something right. I think. Work hasn't contacted me yet (knock on wood. Watch out next week! In the meantime, been relaxing, eating good stuff. Yum raclette! !Damn you cholesterol for one whole evening! (it involves a lot of cheese and good cold cuts- we had bison and viandes de grisons amongst other choices). Veggies too of course. All the good stuff may explain the weird dreams I've been having. First few nights, high anxiety dreams, one featuring zombies. I don't dream often about those. Good, 'cause they tend to be super silent sneaky and creepy in my dreams. Had to sleep in trees to escape at night. No dreams about work or school. YES! Those are boring. Last night, loads of fictional characters just appeared. Some kind of weird reality shift, where everyone was trying to find their way back home while fighting bad guys. I was only a spectator to it all, but I don't care. These three were in it! It was really a short sequence when all three were there, but it was like the perfect team of kick@$$ guys working together. Weird dream logic info: Zhao is foot ticklish. Ha!! Would have loved to do a doodle, but really not set up here (parent's place) to do anything worth posting. And the long epilogue for Water Tribe? Currently clocking in at 22 pages. I may cut one page or two, but I don't know if I can in terms of timing. It's like a whole comic by itself! I'll stop boring you with the non-drawing stuff. Wishing everyone a happy new year in advance!! May 2009 bring everyone fun projects, plenty of inspiration and peace of mind. Oh, fandom; a blessing and a curse. Bleach dream induced headache. Ouch! I rarely have fandom dreams these days, but when I do, it's always fun. Sometimes, all you need is a change in your sleep pattern. Not always easy to do in this day and age, unfortunately. Having a bit of a vacation seems to have helped me. Woot! Sounds kickish! And Zhao foot ticklish. *grin* Although I wonder if Zhao ever had a dream where his toes started arguing with him. Dreams logic being what it is, Zhao can posibly have the weirdest dreams. I had fandom dreams before, but yours sounds epic with that kicka$$ trio. Zhao's really making you work. I rarely have those, but when they happen, they are entertaining. 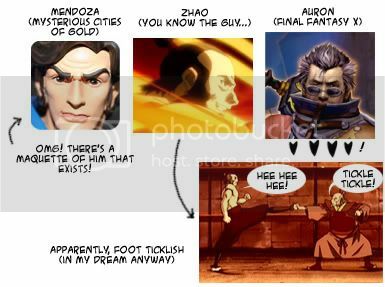 I think my brain imploded by the concept of Auron and Zhao working together. It's just so crazy that it works! I totally adore both those guys. <3 What an awesome dream! I never had that much fictional testosterone in one dream, ha ha! Soo far, all my zombie dreams have them slow and stupid. And never lime sherbet colored- must be what gives yours speed. I get raclette about once every two years or so. It's worth it. Oh so worth it. Sending you best wishes your way too. Lol, too much cheese at night... is sure to bring on a fright :) And, hey, hey you've got a French actor as your pic! I luv his movies. Good old Louis DeFunes- one of my fave comedic actor in the old days. LOL at weird dream info XDD I can't imagine in what context would this be in your dream! Curious though - who tickled Zhao's feet? I'll have to do a Stilton experiment one day, compare it to other types of cheeses. It will be for science! Didn't actually see Zhao getting tickled (ha, that would have been awesome), it's just one of those dream infos that leaked through. Possibly during a discussion. Where on earth did you find that Mendoza maquette!?!? I was looking over the internet for some nice Mysterious Cities of Gold memory,and found maquettes of the main characters available in France (Mendoza, Esteban, Zia and Tao). If I was to buy any, I'd go for Mendoza and Zia. Those two look nice. D: I hate zombie dreams, because they are one of the most likely to keep me up the rest of the night. Though my zombies usually just stand in a room (usually a corner) and DON'T DO ANYTHING. It is very disconcerting. I sense a theme amongst these men. A trend if you will. We approve. X3 And oddly enough...I had a Zhao appearance last week! He was helping me avoid the evil Rebel (yes, STARWARS) Forces! XD The man gets around! At least, your zombie would be easy to escape from! Zhao in Star Wars- oh yeah, I can see it. It seems I'm not the only one with a certain fondness for that character. Hey wasn't the new avatar comic supposed to first appear in the December issue of Nick comic mag? Was it delayed? Thanks for any response. I remember seeing one comic in an issue that was in store in the month of November. A lot of magazines when they say "December Issue" sometime are on the shelves the month before. Also, Nick sometimes publishes an all comic issue along with their regular magazine. The Avatar comic appeared in an all comic issue where Spongebob was on the cover. Keep your eyes open and leaf through every Nick magazine publications. I don't have a much better technique than that, I'm afraid.